Good afternoon! Today is my 29th birthday. Hopefully next year I will be able to say I am healthier, physically, mentally, emotionally, and spiritually. I am starting a new weekly feature on my blog. It’s fairly common on most weight-loss blogs to have a weigh-in day every week, but I found Ashleigh’s way of doing it over at Passion for Life, Love, and Health to be the most inspiring… so in a sense I am copying her. Thanks for the idea! It has fluctuated a LOT this week, I’ve seen as low as 305 and as high as 317. The issue is constipation (sorry, I promise not to talk about poop on the blog a lot!) due to my medication. After failing to fix things through diet, water intake, and working out, I have added some new things in to my daily regime and hope to see a difference next week. Despite not seeing a true loss this week I have seen some body changes. I am down a pants size, and down a dress size as well. My ankles aren’t as puffy, and I desperately need new pajama and scrub pants, they will not stay up. 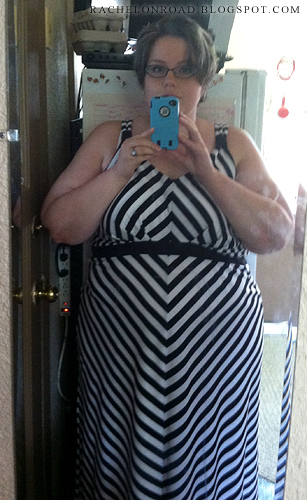 New dress for my birthday, one size smaller than before. This week was a mixed bag. First week back at work was awful, I haven’t felt well due to the medication… On the upside, the dizziness has finally gone away! I feel more normal mentally, like something in my brain is finally connected. My new computer is awesome (yay netflixs!) and I love being online again. I didn’t work out as much as I wanted, but I did get a lot of things done in the house and the garden. 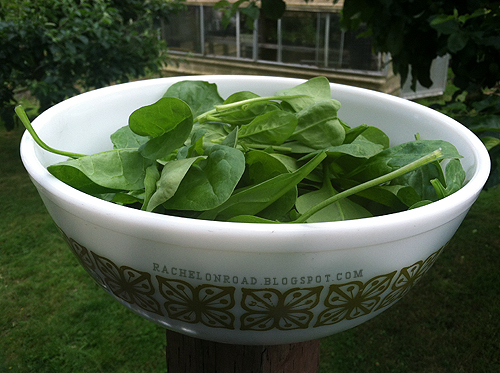 Look at my first bowl of spinach from the garden! Spinach I grew myself. Mmmm. Work out 3 times by Monday. 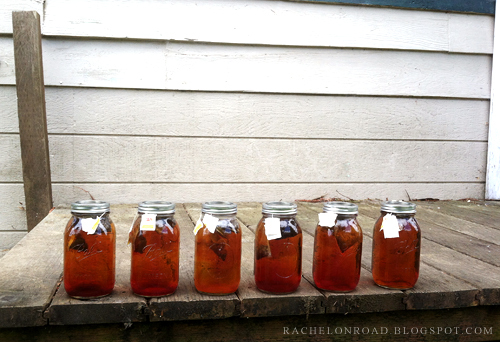 Sun tea brewing on back porch. YAAAAAAY NSVs!!!!!! Non scale victories are always fun! DUDE. You grow your own spinach! That’s awesome. I might be jealous. You are awesome, Rachel! Keep it up. I hope you had a great birthday and I LOVE the new dress. Good work Rachel! You inspire me to keep working on my health!